Hip In Detroit: Win Tickets to Pianos Become The Teeth and TWIABP! Win Tickets to Pianos Become The Teeth and TWIABP! The World is a Beautiful Place & I am No Longer Afraid to Die and Pianos Become The Teeth are currently out on the road on a co-headlining tour and they're making a stop in Detroit on Wednesday, August 12th. 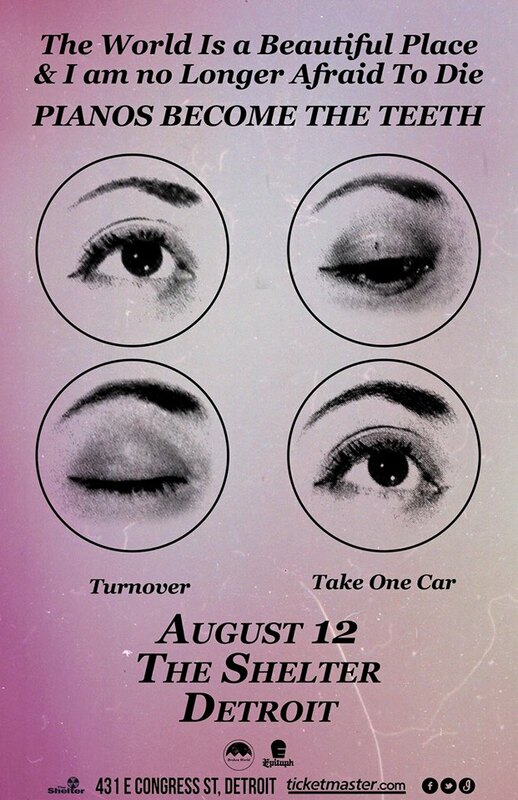 Black Iris Booking is bringing them to The Shelter along with Turnover and Take One Car. TWIABP just released their newest EP Death To New Years on Topshelf Records back in July. You can take a listen to it on Bandcamp here. Pianos Become The Teeth released their latest album last year, entitled Keep You. They just released a music video this week for the first track off of that album, "Ripple Water Shine". You can check that out below, but we're warning you, it will probably make you cry. 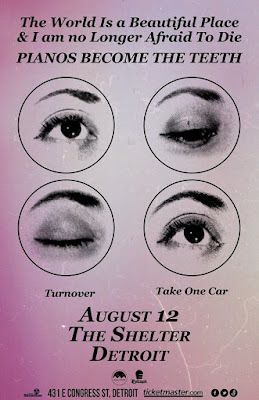 Hopefully Pianos Become The Teeth won't make everyone cry at The Shelter on Wednesday, too. Tickets for that show are $15 and can be purchased in advance here. We are also giving away a pair of tickets to one lucky fan courtesy of Black Iris Booking. To enter, please email your full name to hipindetroit@gmail.com with Pianos in the subject. We will draw the winner the morning of the show and email them details on how to claim their prize. Wednesday's show is set to start at 7 p.m. and all ages are welcome. For more info, click here. What's Up With All of Those Resale Shops on Woodward? 4/26/19 - Chaos & Carnage Tour @ The Crofoot w/ Dying Fetus, WhiteChapel, Revocation, Buried Above Ground, and more! Celebrate Labor Day in Hamtramck! Who Wants to be in a Gosh Pith Music Video? Who has a $1,000 Smile? Hip In Detroit Gets a Room Of Our Own! © Hip In Detroit 2011. Powered by Blogger.